A Netflix movie and Chinese food…again? Let’s admit it, it’s easy to get in a rut with your date nights. Researchers have found that successful couples spend time each week having a date night (check out what else successful couples do). 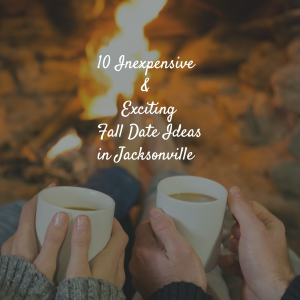 Now that fall is finally upon us, here are 10 exciting fall date night ideas for you to enjoy in the Jacksonville area. And the best part? Most of these are free, or fairly inexpensive. Good for your relationship and your wallet? Score! Get lost together in a corn maze. What spells fall like a corn maze, hay rides & and apple cider? If you’re willing to take a drive to Hilliard, check out Conner’s Amaizeing Acres…it should be lots of fun! Calling all foodies! Jax Truckies 4th Annual Food Truck Championship on October 3rd from 4-9pm at the Jacksonville Landing. Featuring 20+ food trucks, giveaways, a live DJ. Plus, proceeds benefit Big Brothers and Big Sisters. Enjoy the beautiful beach and picnic with your favorite person at Hanna Park. The park is opened year round, from 8 AM to 8 PM until the end of October, then 8 AM to 6 PM November through March. Spooktacular at the Jacksonville Zoo & Gardens. Enjoy fun for the whole family at this not-so scary attraction, October 16-18th. Visit a Pumpkin patch. Grab a large pumpkin to carve together. Take your phone or camera so you can snap some great photos of you two in all the fabulous pumpkins. There are several pumpkin patches around, two of which are at Christ United Methodist Church Neptune Beach and EastCoast Land Care. Who doesn’t love the Blue Angels? They always put on a show to impress. Enjoy a sky show by the famous Blue Angels at the Sea & Sky Spectacular, October 24 & 25th, from 9:30am-3:30pm. Go on a nature trail together. Now that the weather is cooling off, it’s a great time to enjoy the outdoors, and the UNF’s Robert W. Loftin Nature Trails are a must. There are five different designated paths, each varying in length and landscape. The trails also include the “Sawmill Slough Preserve,” a three-hundred acre wetland habitat. Not only can you walk, workout, fish, and sight-see, but UNF also has equiptment rental services where you can check-out paddle boards and kayaks, and they also have a zip-lining course. If you are a student, these services are free. UNF’s nature trails are free and accessible to anyone. For those cozy nights at home, build a fire in the backyard and roast some marshmallows together. A fire pit is recommended! 🙂 S’mores, anyone? Visit Nights of Lights in St. Augustine. This year, Nights of Lights “turns on” November 21, 2015, and continues through January 31, 2016. Ride the trolley with a cup of coffee and snuggle up to the one you love, in a romantic setting of millions of tiny white lights that create a magical atmosphere in the Nation’s oldest city. Attend the Annual Christmas Tree lighting, November 27th at the Jacksonville Landing. The day after Thanksgiving, Jacksonville welcomes the holiday season with a spectacular riverfront tree lighting ceremony. There you have it, 10 fabulous, inexpensive and exciting fall date night ideas for you and your sweetie. So mark your calendars, make the priority…and schedule your fall date nights. You’ll be glad you did. Pumpkin latte, anyone? What are your ideas for date nights in the fall? I’d love to hear your ideas!